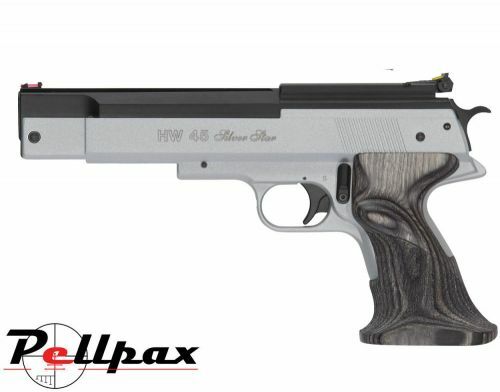 This special Silver Star version of the world famous and ever popular HW45 combines high power and accuracy with a great appearance to make one of the most well rounded air pistols on the market today. Made and designed by Weihrauch for serious airgunners, the HW45 produces over 5ft/lbs of muzzle energy to make it one of the few spring powered air pistols that is suitable for hunting vermin and pest control. This high power also leads to far flatter trajectories which in turn improve accuracy. The over lever cocking design is similar to Webley pistols but is much more attractive and has actually been designed to look similar to a Colt 45 pistol. The HW45's trigger is two stage and is also fully customisable to suit your preference and makes this pistol ideal for a variety of shooting disciplines. The barrel is rifled to aid accuracy whilst the adjustable sights and dovetail grooves allow for the easy attachment of a scope or laser for pin point precision. Please note you will require the specialist 13mm Mounts to fit additional optics to this pistol. Add this item to your basket & spend an extra £155.01 to apply for finance.